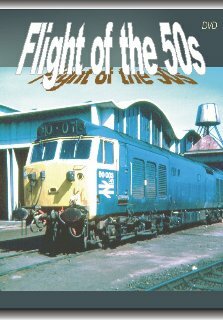 This DVD is packed with 85 minutes of non-stop Class 50 action. It features every single member of the Diesel Electric Type 4 Class as well as the first prototype. You will be taken through the whole era of the class, starting from 1962 right through to the present day. Commencing with the operations on the London Midland Region (LMR) of British Rail (BR) including some views after they were transferred to both the Western and Southern regions of the rail network. Going to Scotland and the North West of England, D400 can be seen in action, both in pairs and singly, early Class 50 scenes at Reading, Paddington, Bristol & Penzance, newly named locomotives, refurbished examples entering rail traffic, 50149 in action in Cornwall, an extended look at Class 50 rail-tours, plus the first firing-up of 50049 on the scrap line and even a cab ride in 50029. The programme runs for over 85 minutes for your complete enjoyment and has the option for listening to or muting the brief commentary that is provided.